So this year my partner Tobie and I pretty much committed to watching the full core season of Repertory Philippines. Beyond the fact that season tickets are sold at a bit of a discount, this year's set of plays certainly sounds most promising indeed. As much as I love musicals, I also have a special place in my heart for straight plays. And not all plays are overly serious dramas (which I do enjoy as well) - there are those that are quite the delightful comedies that are more than just a little fun. And the farce is a classic concept in theater - the comedy that tends to push the boundaries of the normal and indulge a bit in rather more extreme situations to push the humor element. These days when movies try to go down this road, we end up with some lousy slapstick (or worse gross-out) humor. Theater tends to keep things just at the edge of what is acceptable. And thus still fun on the whole. 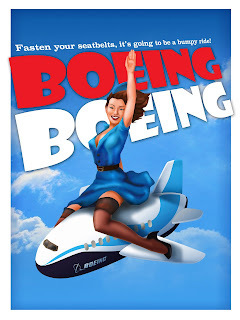 Synopsis: Boeing Boeing is classic farce originally written by Marc Carmoletti, a French playright. It was adapted into English by Beverly Cross and Francis Evans. The show holds the 1991 Guinness record for being the most-performed French play around the world. It's the 1960's and Parisian architect Bernard (David Bianco) is living his dream life of sorts - in this case it's being involved with three different flight attendants, all of whom think they're his fiancé. And the primary witness to all this is his maid, Bertha (Joy Virata / Baby Barredo), who still tries to help Bernard juggle his various women including cooking the right meals and and making sure personal effects are cycled out as needed. But then Bernard's old school friend, Roger (Topher Fabregas) comes to visit out of the blue in hopes of settling down in Paris and finding a woman of his own. Bernard insists that Roger stay with him until he finds a place of his own - and to show him just how fabulous his little set-up is. 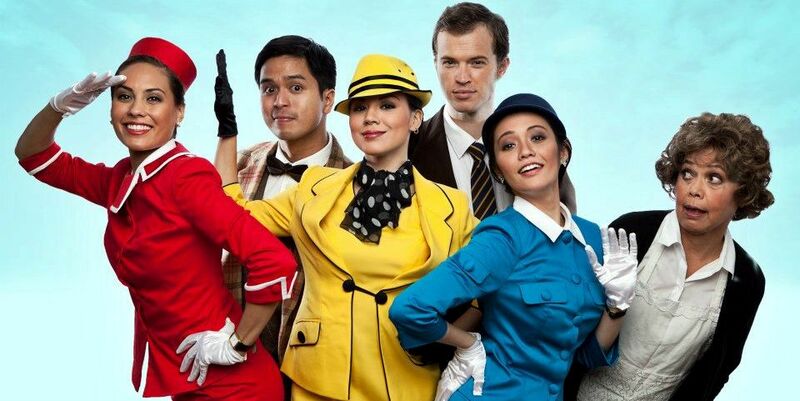 Given the flight schedules of the different airlines that the girls work with, Roger eventually meets the American Gloria (Jennifer Blair Blanco) who flies TWA, the Italian Gabriella (Giannina Ocampo), who flies Alitalia, and the German Grethchen Carla Dunareanu), who flies Lufthansa. But when weather trouble starts to cause delays in the various flights. it looks like Bernard's perfect little schedule is about to get drastically re-arranged. Now our two male leads definitely weren't the core focus of things, when you really get down to it. Bianco (last seen in Next Fall) is the straight man, from a comedy perspective, and so he really doesn't get the chance to have most of the humor. There was more riding on the shoulders of Fabregas as the friend Roger, although his delivery wasn't quite on the mark for what I had hoped for the play. He certainly had some really funny lines and crazy situations but his timing and pacing wasn't always on key. There were a lot of moments when he could have benefits from a brief pause between a punchline and the next sequence of dialog and other times when his nervous rambling didn't sound quite as focused. It was clear to me that he was trying to emulate the Jerry Lewis performance in 1965 film adaptation. Naturally the girls stole the show - or at least our three air hostesses did. Beyond their vibrantly-colored costumes and natural sexual charisma, they had the bulk of the comedic moments, which they handled particularly well. And as much as Ocampo was admirable in her efforts to consistently maintain her Italian accent throughout the play, the real gem of the performance naturally goes to Dunareanu whose depiction of Gretchen was hilarious without becoming too much of a German caricature. Let's face it, she had the advantage of having some of the best lines and sequences to aid her, but clearly it was her performance that tied everything together. I was hoping for a bit more from Bertha, who was played by Joy Virata in our staging. And I don't necessarily think it was the fault of her acting (but that will always be a factor), but maybe it was also the way the character was written. Maybe I was just overly influenced the likes of Noises Off, but having the maid as sort of the constant character who knows about all three women sort of had me hoping for more key lines that would act as running gags or something. She was still pretty funny, but I expect there could have been a bit more. Boeing Boeing is still one of the better comedies that I've seen come out of Repertory Philippines in recent years. I strongly encourage you geeky readers to check out the show and enjoy one of the smarter comedies that you'll get to experience anywhere around. Thus the production gets a roaring 4 airline-associated travel bags out of a possible 5.